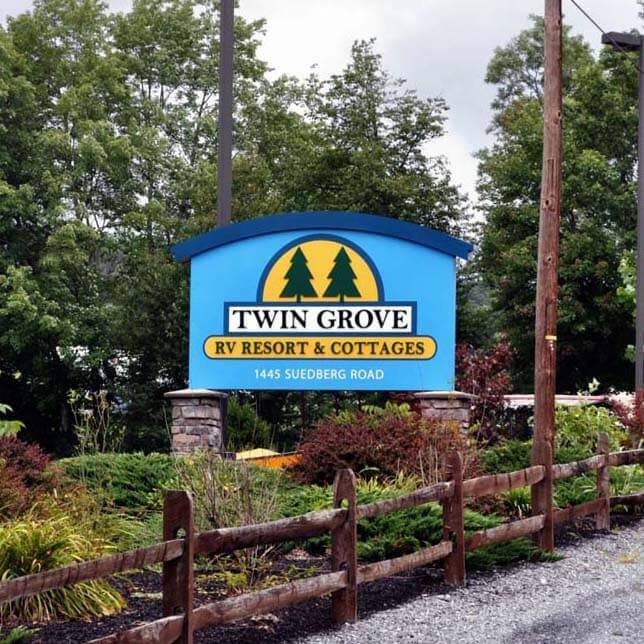 With a rich history as a country park that dates back to 1930, Twin Grove has 212 RV sites, 43 Cottages, 18 cabins, 4 Family Lodges, 22 tent sites and 2 yurts. We are a 105 acre destination resort campground nestled in the rolling mountains of central Pennsylvania. The property is pristine and full of family fun. Everyday amenities include 2 spacious pools with spiral slides, 9000 sq ft resort center with a large store/registration area and restaurant. 3500 sq ft recreation center with arts & crafts upstairs daily and a Ice Cream Shop on the main level with a recreation room. Adjacent to the Ice Cream Shop is the fitness center where you can go work off your ice cream! 70 seat indoor movie theater in the 3300 sq ft lodge which you can rent for weddings, anniversary parties, birthday parties or any special event. 2500 sq ft air conditioned game arcade with state of the art games & prizes. The breathtaking Swatara State Park is located just across the street. Perfect for hiking and biking. The ride area includes a full size Allen Hershel Carousel, 60 ft Garbrick Ferris Wheel, 3 inflatable rides and the Royal Express trackless train. The band shell has live “Music in the Park” many weekends from Memorial Day – Labor Day. Enjoy our theme weekends that include a live rodeo, fireworks, pet parades, tye dye t-shirts and pool parties. Go play a round of 18 hole disc golf with the family!